The exhibition of art opened at the Susan Mains Gallery on Thursday last was an immersion experience. As soon as one stepped into the gallery, the feeling of the rain forest dominated. Accentuating that was the sound track for the evening—tropical rain in a thunderstorm. Unlike the French artist Henri Rosseau who painted his tropical scenes from the Paris Botanical Gardens, we can be quite sure that these paintings were executed by someone who had actually been in a rain forest. Susan Mains continues a series that she has been working on for more than 4 years, but has not been seen before in Grenada. The restoration she speaks of is the imaginary proposition that a human spine could be fixed with the strong architecture of a heliconia flower. The figure sitting and hugging his knees in depression could be cured with the turmeric growing at his feet. A heart transplant is suggested with the flower of a banana. The latest iteration of this work was nature having the ability to heal a troubled mind. 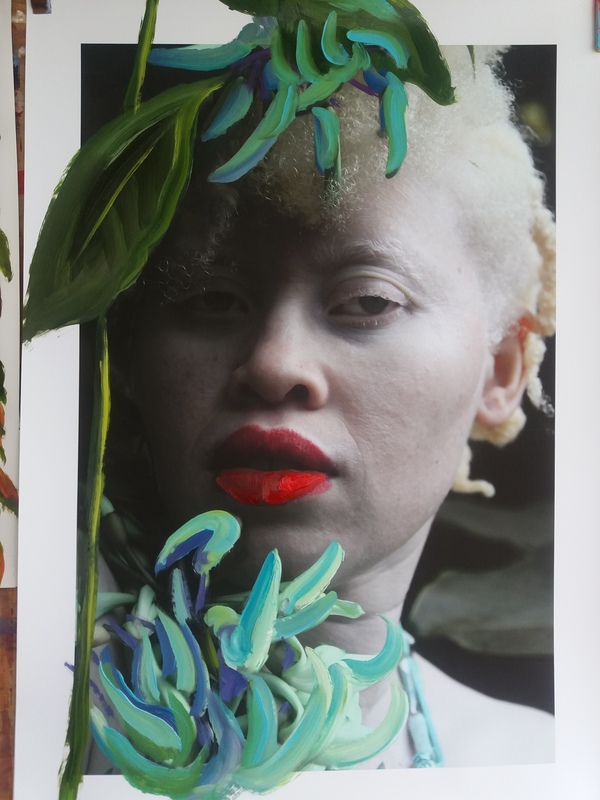 The model for this is albino, so her very rare skin colour also added another layer of interest. This series had been previously seen in Barbados, Brasil, and Colombia. Enhancing the space and completing the story is the work of sculptor Rene Froehlich. His light, ethereal figures suggest bodies in their parts. The abstractions he creates are intriguing, and always compel the viewer to spend a minute more trying to understand the meaning. Of course each viewer can interpret his own reality. Rene works with fibre glass for this project. He has been a sculptor for more than 30 years, previously working with glass, wood and metal. His recent foray into building an RF 33 racing sail boat gave him lots of experience with using fibre glass. He then in turn made this a part of his art work. The exhibition will continue through Dec 2, and admission is free. 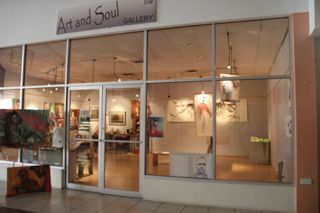 Susan Mains Gallery is located at Spiceland Mall, and is open 10 am to 5 pm Monday through Saturday.